The following is a summary of rules for this age group. · Teams in the U10 age group will be divided into separate leagues for boys and girls. · Roster Size: 7-14 players. · Players on field: 7 vs. 7 including goalkeepers. · Goal Size: 6 feet x 18 feet. · Coaches ARE REQUIRED to have game cards and ARE NOT required to have player cards. Game cards should be any printed document with first and last names of each player printed as well as jersey numbers. The template for this may be unique to each club. · Game Duration: 2 halves, 25 minutes each. 5 minute half-time. a) Free Subs (at GA Soccer regulated stoppage of play; e.g., goal kicks, throw-in’s offensive teams may substitute, etc). b) Players should be at midfield and off the playing surface until the center referee indicates they may enter the field of play. · All players must play 50% of each half and preferably ¾ of a game. · Offside rule will be in effect. · Intentional heading will not be allowed. Violation of this results in an indirect free kick per GA Soccer rules. · Penalty kicks will be taken at a spot 8 yards from the goal line. · Throw-ins will be utilized to restart play when ball goes over touchlines. · Goal Kicks: placed in goal area. · At least one referee will be scheduled to officiate each game. · Recommended that Goalkeepers must play an equal amount of time on the field as in the goal. U9/U10 Development Rule "The Build-Out Line"
The build out line is used to promote playing the ball out of the back in an unpressured setting. 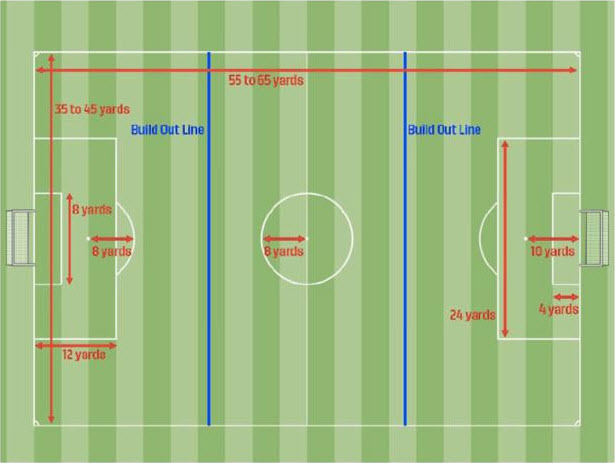 · Buildout lines should be equidistant from the penalty area lines and halfway line. A dashed line may be used for the buildout line to assist players in understanding where the buildout line is. · When the goalkeeper has the ball in hand during play from the opponent, the opposing team must move behind the build out line until the ball is put into play. This includes goal kicks. · Once the opposing team is behind the build out line, the goalkeeper can pass, throw or roll the ball to a teammate. Punting and drop-kicking are not allowed. · The ball is deemed in-play once it is released from the goalkeeper’s hands or kicked on goal kicks. The opposing team can cross the build out line and play resumes as normal. · The build out line will also be used to denote where offside offenses can be called. Players cannot be penalized for an offside offense between the halfway line and the buildout line. Players can be penalized for an offside offense between the buildout line and the goal line.